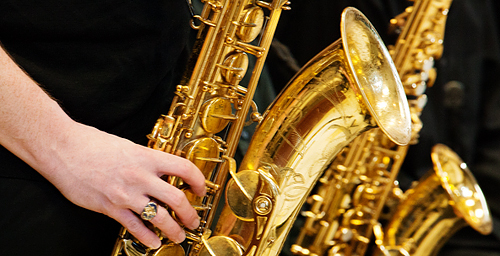 The University of Illinois Jazz Saxophone Ensemble gives five select saxophone students the opportunity to grow together as a group in terms of reading, musicianship and improvisation, in conjunction with a full rhythm section. A wide range of compositions and arrangements for this setting are studied, and equal emphasis is placed on reading and soloing. This group is the perfect bridge to playing in one of our big bands, and students greatly benefit from the opportunity to focus equally on both ensemble and solo playing. Jazz Saxophone Ensemble has at least three public performances each semester, including the final concert at Krannert Center. For more information, contact the chair of the Jazz Performance division, Prof. Chip McNeil.